Our family loves to travel but we always travel on a shoestring. It is very important that we stick to our budget so we won’t overspend the hard-earned money. Traveling may be costly but there are different ways that you can do in order to save. You can book cheap airfare, stay in budget hotels, bring snacks, DIY your trip and many more. Aside from the airfare, the next big chunk of your travel expense is accommodation. We all know that people have their own preference when it comes to accommodation but for a budget traveler like me, if the money is limited I will search for hostels, budget hotels or vacation rentals. Whenever you travel, all you need is a place to sleep so staying in a hostel or budget hotel is a nice way to save money. 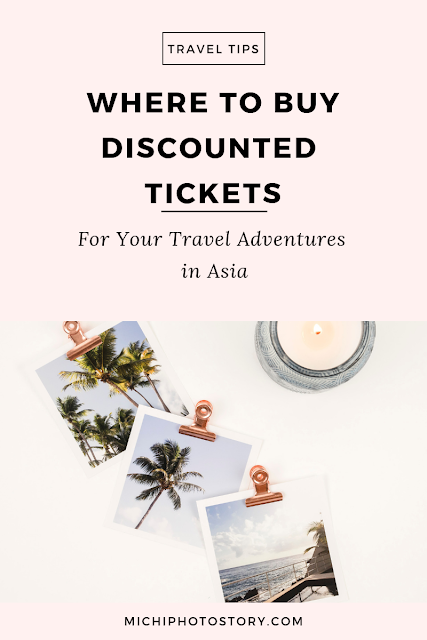 If you are a regular reader of this blog, you know for sure that we already stayed in hostels and budget hotels in and out of the country. 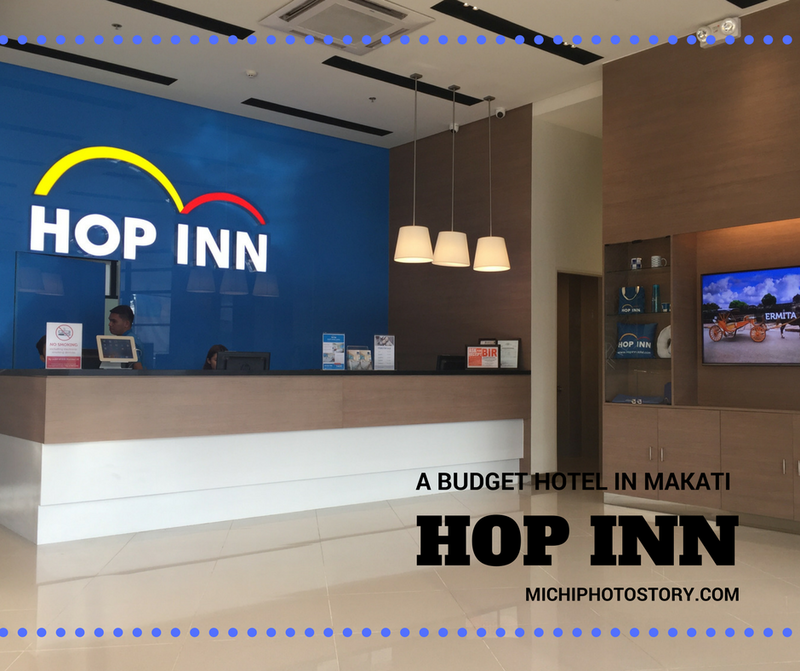 Speaking of the budget hotel, last Saturday our family had a complimentary stay in Hop Inn Makati. Hop Inn is a network of budget hotels in Thailand and Philippines. 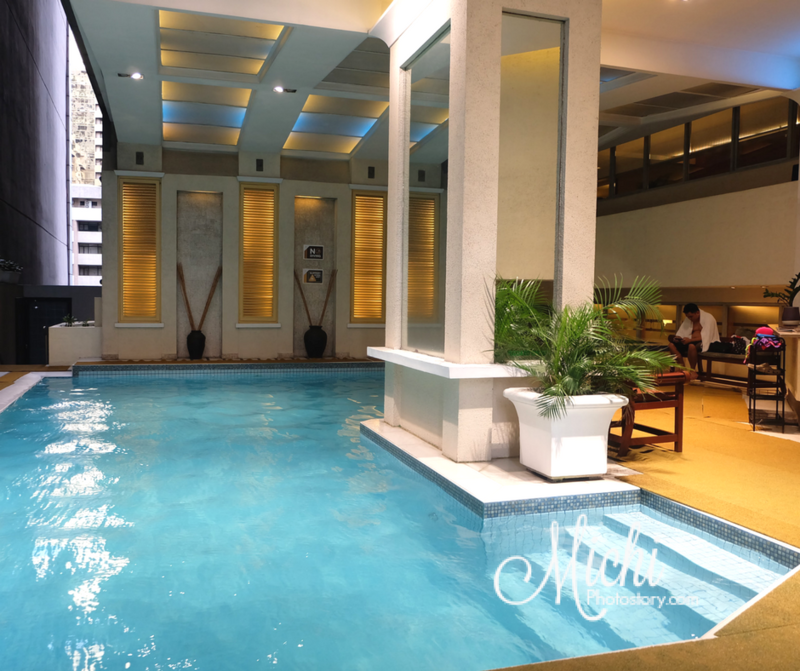 They have 28 hotels and two are located in the Philippines, one in Ermita, Manila and one in Makati Avenue. 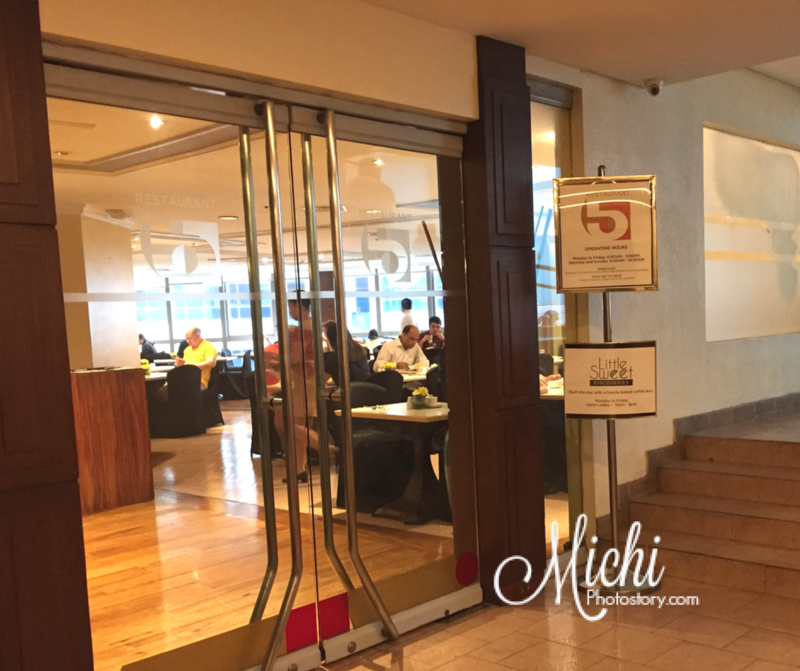 After our trip to Uptown Mall BGC, we went straight to Hop Inn Makati. We were lucky that we still got a parking slot. I think there are only 7 parking slots in front of the hotel, I’m not sure if they have other parking areas. There is a staff at the parking area who assisted us. He even asked for our things but my husband said, “isa lang naman, ako na magdadala”. Then he ushered us inside the hotel. It was almost 3PM so there a lot of people at the reception area. I patiently waited for my turn, I gave my ID and the staff asked me if I have reservation or walk-in? I signed the form and they gave me my key card and off we went to our room. 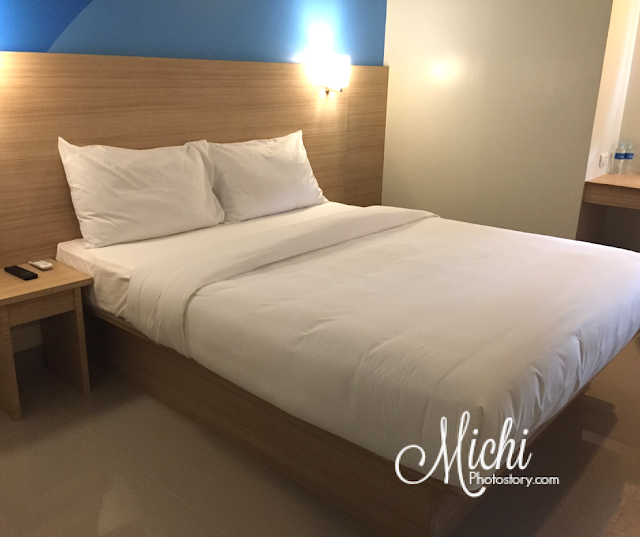 Hop Inn has two room options which are Standard Double Room and Standard Twin Room. 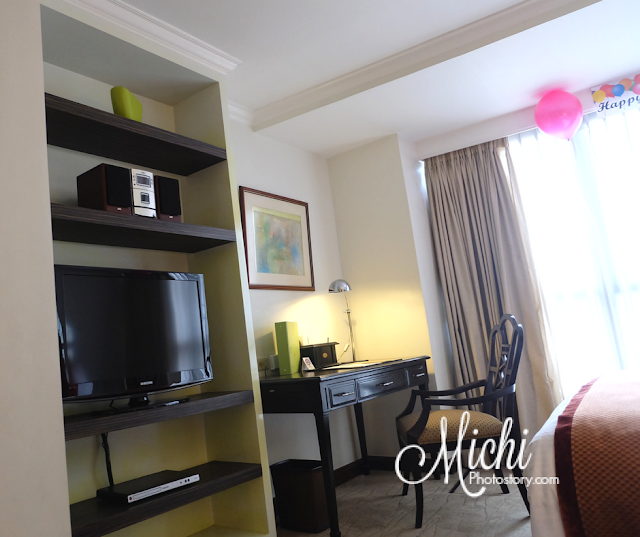 As of now, the introductory rate is P1720 net per room/night. 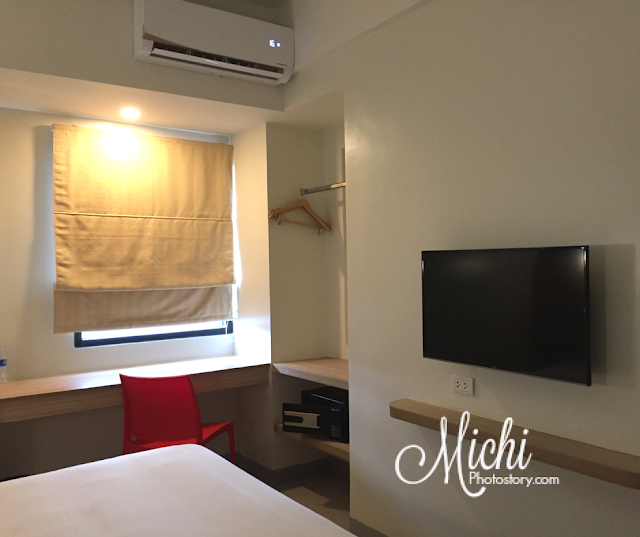 The room comes with flat screen TV with cable channels, free wifi, aircon, personal safe, desk and chair, hot and cold shower, hairdryer, clothes rack, towels and lines, and complimentary bottled water. 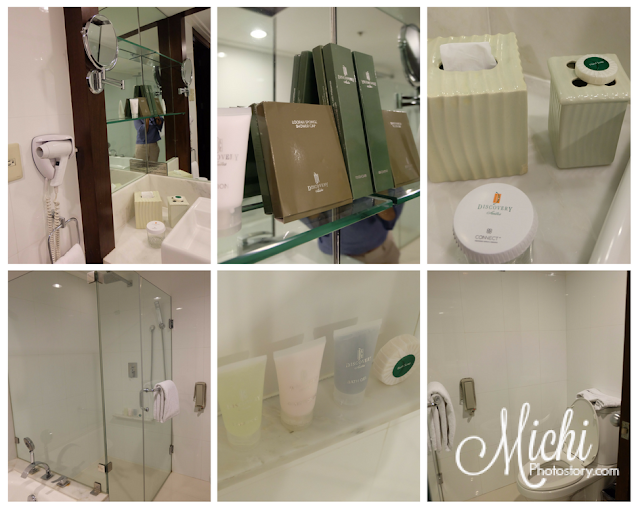 There are no free toiletries so don’t forget to bring one but just in case you forgot it, don’t worry because you can buy at the hotel. As expected, the room is just small but it is clean. One thing that I don’t like in budget hotels is the bed and pillows, madalas yan matigas so I was surprised when I checked their bed and pillows, it is comfy. My husband who always stays in five-star hotels (business trip) also agreed with me. 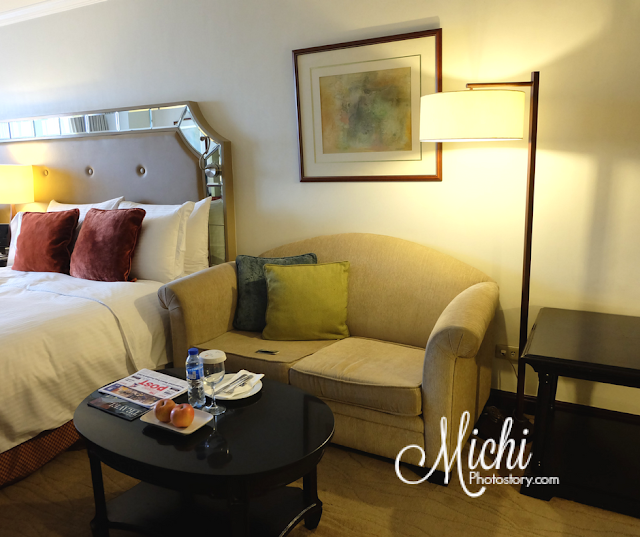 The room is good for 2 persons pero nagkasya naman kaming tatlo, hehehe! The bathroom is clean too and it has a bidet. The towels are soft din, mukhang bago pa. The hotel only offers basic accommodation, there is no restaurant so my husband went to Rufo’s Famous Tapa for our dinner. 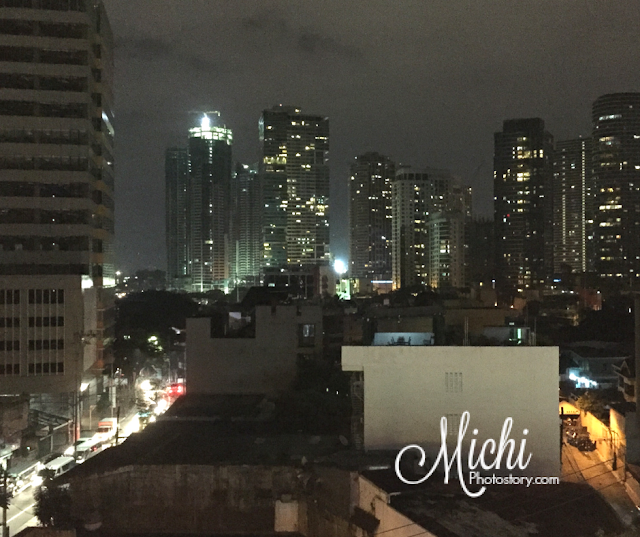 Walking distance lang siya from the hotel, I even saw Barrio Fiesta restaurant too. The nearest mall is Century City Mall. The location of the hotel is near the busy road so expect that you can hear the noise of the traffic. Check-out time is 12NN but we left early so we can eat breakfast at home. I just gave my key card, then they checked the room and informed me that I can go. Service is good, the staffs are all approachable and smiling. The staff assisted us from parking and hanggang sa pag-uwi namin. 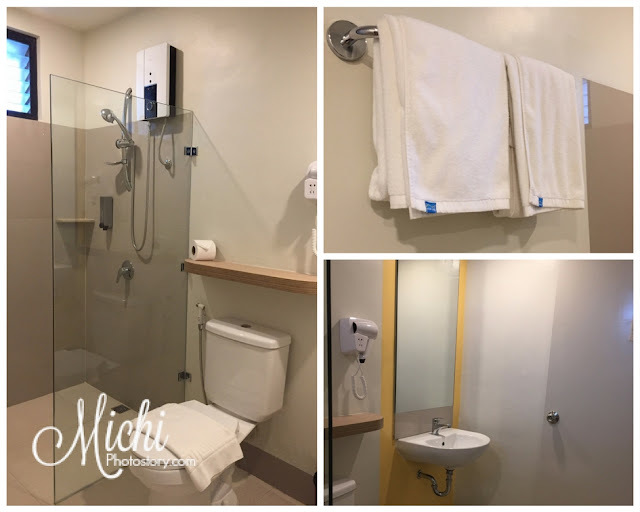 If you are a budget traveler, backpackers or leisure traveler and you are looking for a budget-friendly hotel in Makati, you can check Hop Inn Hotel. It offers basic accommodation at an affordable rate. The hotel is not for family staycation since there is nothing to do here except sleep and watch TV. My son always looks forward to swimming pool and kid's play area. 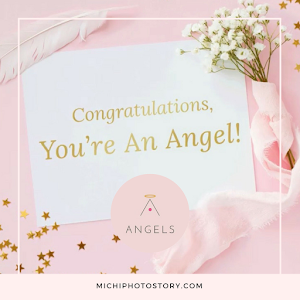 Check out for some vouchers from Booking.com which would help you get more deals and discount for your stay in Hotel HOP INN. A few months after we visited Japan last year, I’ve been reading and seeing posts about Anello Bags. 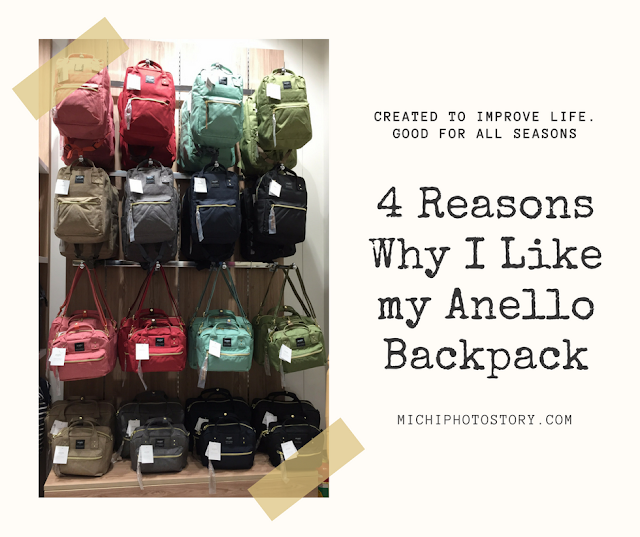 I even saw a video that shows, how you can fit your stuff in one Anello backpack. 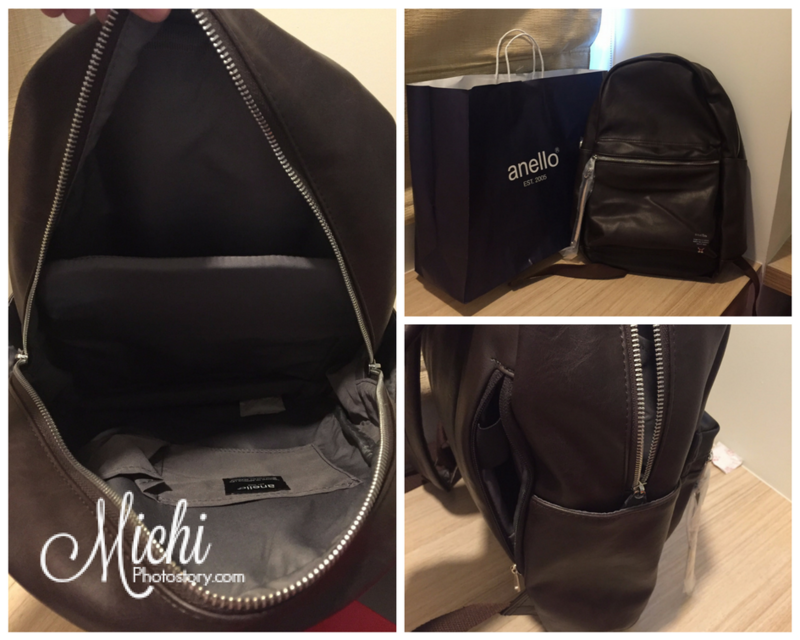 Okay siya na travel bag so at that moment, I wanted to buy it but I don’t know how because there is no Anello stores in the Philippines. If only I see those videos before our trip to Japan, nakabili sana ko. Though I’ve seen some online shops which sell Anello, I was hesitant to buy because I am not sure if they are selling the authentic bag. 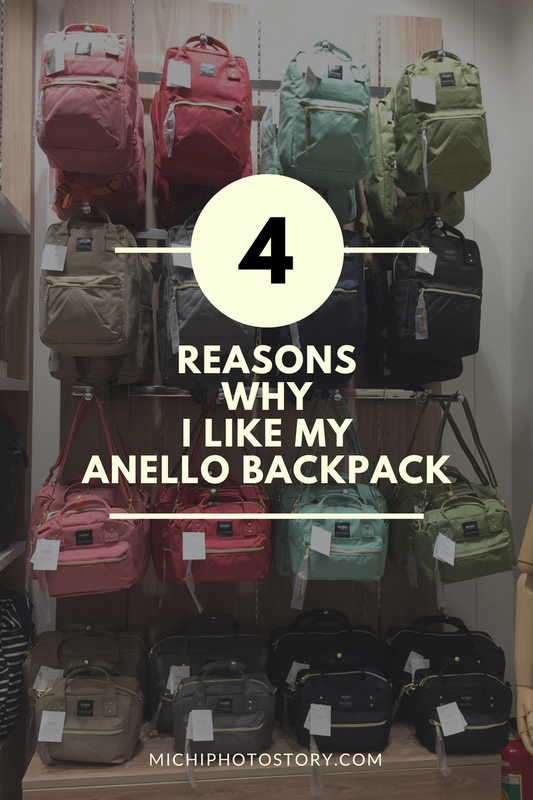 So I was happy when I learned that there is already Anello store in the Philippines, the only problem is ang layo ng SM Megamall. 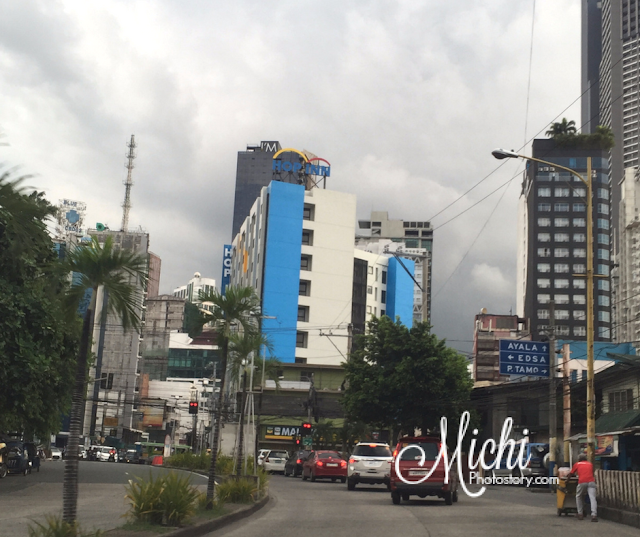 Last June, we went to Uptown BGC for Father’s Day celebration and I saw Anello Store but it is not yet open. Then a few weeks ago, I asked my husband if open na ba yung Anello sa BGC and he said yes. 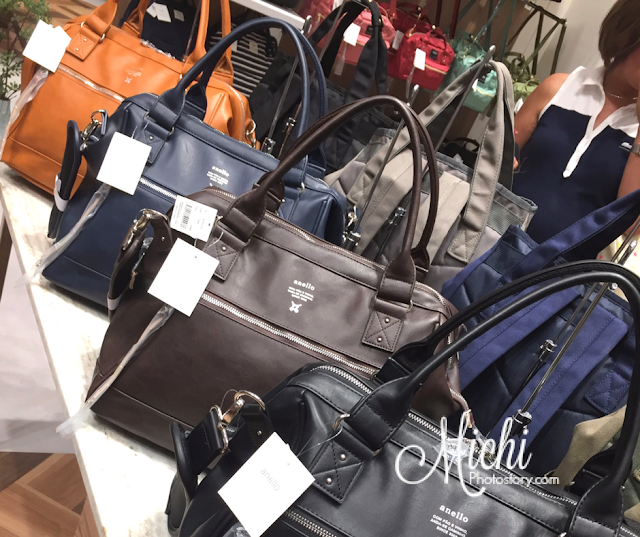 Gusto ko sana magpabili but I changed my mind, mas gusto ko makita ng personal yung mga bags. I’ve been checking their FB page looking for bag designs and I save those I that I like. Last Saturday, off we went to BGC so I can buy my travel bag. 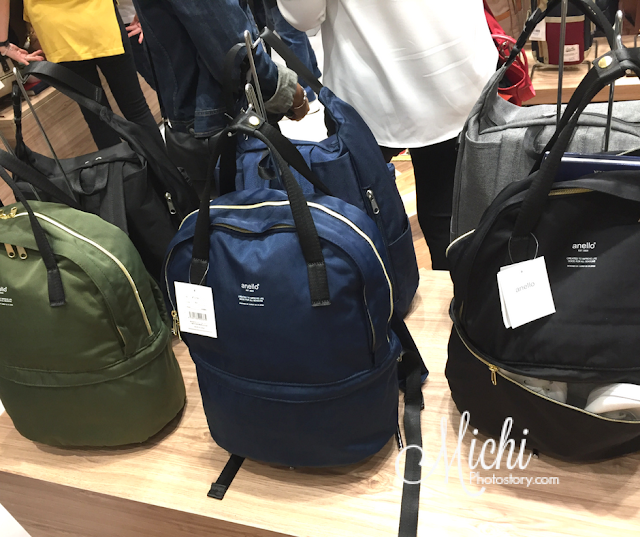 I immediately look for the backpack that I like and the staffs are very helpful to show me the features of the bag. I like the bag but I’m not sure if my laptop will fit. So I put down the bag and check other bags, then I saw this white Boston leather bag and when I checked the price, mas mura siya. But I have to remind myself the reason why I was there. I need a backpack so I don’t have to use my son’s bag again. I used his bag when we went back to the Philippines, hindi kasi kasya sa handbag ko yung laptop ko. Well, it is a long story but it is also the reason why I want a travel bag that can fit my laptop. 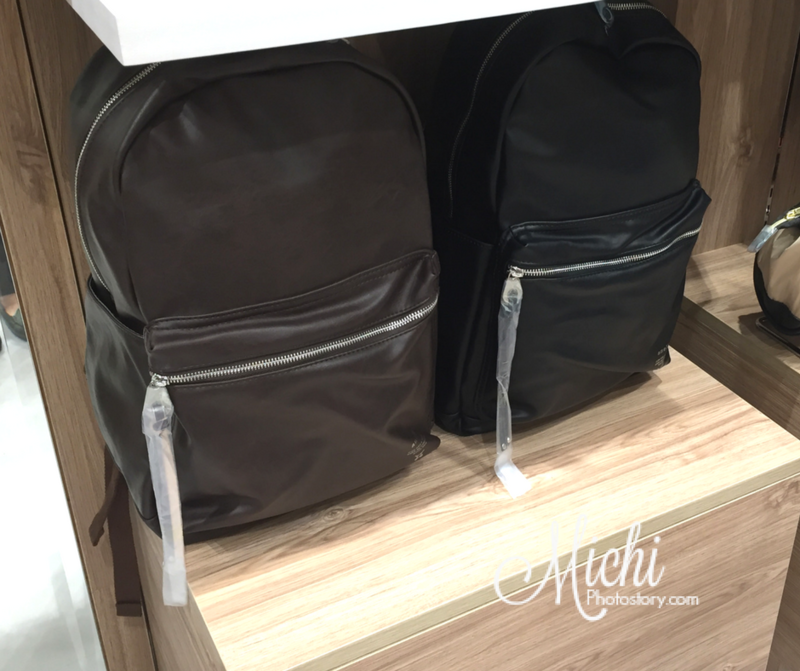 Then I checked the leather backpack and it has a laptop compartment. I liked the bag but I was hesitant kasi baka ma-peel off siya pagtagal. It took me a long time in deciding, natatagalan na nga sa akin ang mag-ama ko. Hehehe! So after several minutes, I finally bought my first Anello Backpack, at first, I wanted the black one pero I ended up buying the brown para hindi common na kulay. I haven’t used it yet since wala pa naman kami alis. Hehehe! 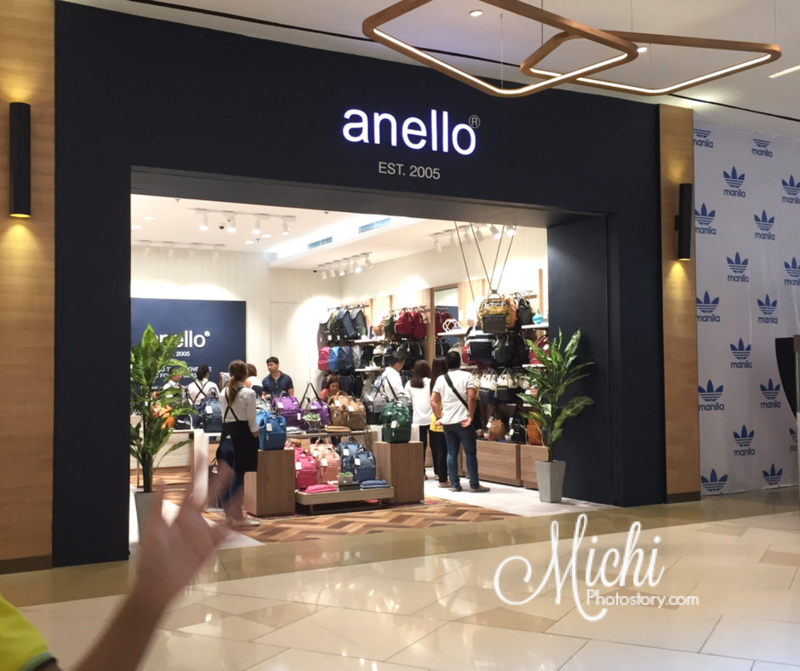 Yesterday, I learned na mag-open na daw ang Anello sa Alabang Town Center this coming September 1, 2017. I don’t know kung matutuwa ko o maiinis kasi dumayo pa ko sa BGC tapos magkakaroon na pala sa ATC this Friday. 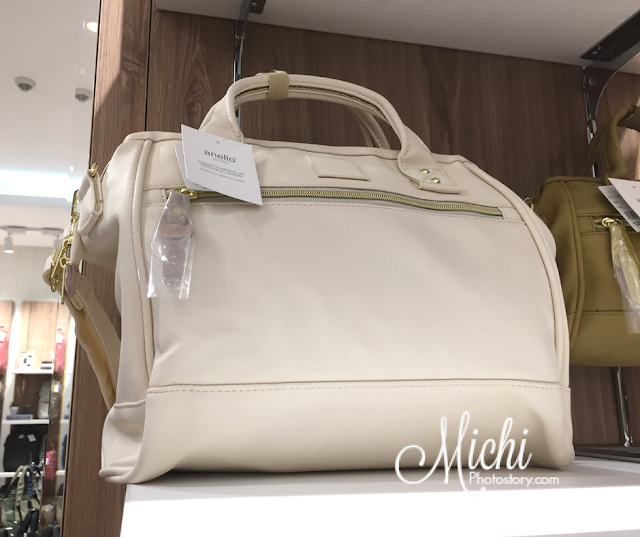 Anyway, at least mas malapit na branch, pwede ko mabalikan yung Anello PU white leather boston bag. Hehehe! 3. Easy access and there is zipper at the back of the bag. Can Meditation Really Help You? 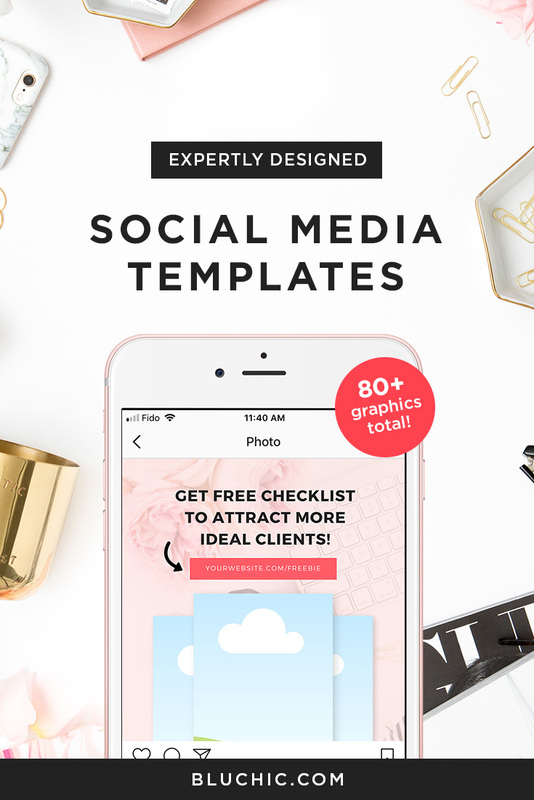 Besides the benefits that were highlighted, we should also focus on some others that are much lesser-known. Meditation has been shown to increase DHEA. This facilitates hormone production and increases metabolism speed. Melatonin increases appear. Melatonin will act as a strong antioxidant in your body, helping to fight depression and improving the immune system. Cortisol decreases – Cortisol, the stress hormones, makes your body retain dangerous fat, thus leading to diabetes and heart disease. Many relationships end during periods of strong stress. Couples end up arguing and eventually the gap that is created is so high that it is impossible to go over all the damage that appeared. Meditation helps the individual to keep anger in check. At the same time, it is going to help a lot in aiding the body to respond better during stressful periods. As the person that meditates becomes calmer, arguments are much easier to solve. You listen to the partner more and find it much easier to make good decisions that help the two of you as a couple. If both meditate, the connection that is established is even stronger. We already talked about stress and meditation is really good at helping people deal with stress but another thing we should all know is that meditation automatically helps to reduce anxiety. As the number of people that suffer from anxiety is growing, so does the number of people looking for solutions. Meditation is highly effective at calming the mind and the body. This makes it easier to focus on what happens around you. Anxiety is much easier to cope with and that means decisions made will be better. 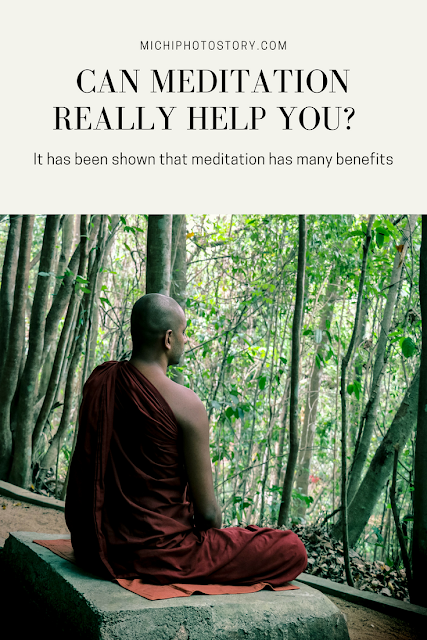 Meditation is definitely helpful and it can be said that it does have associated benefits for most people from around the world. The simple fact that it is easier to deal with problems and stress can help out a lot in the modern society that is governed by a fast pace when doing practically anything. However, this is only possible when meditation is done right. There are many gurus out there that are not legit and that take advantage of people in bad situations. Do be sure that you learn meditation from someone that has your best interest in mind and is not looking for your money. August is my birth month so these past few weeks, I’ve been contemplating if I will celebrate it or not. If I will celebrate, will I celebrate it in advance or on the day? My two dilemmas are, first, my birthday falls on a weekday so my son has classes and second coding kami sa birthday ko. Waah! Of all the days pa, coding pa talaga natapat so even I wanted to eat in the nice restaurant, hindi ko makaaabot sa Alabang. Hassle kung magcommute kami at maulan. I also waited for my son’s schedule because last year, we were able to celebrate my birthday in Singapore because they have no lessons for one whole week but unfortunately, they have regular classes after the periodical exam so ayaw ko siya umabsent para lang sa birthday ko. Finally, I decided to celebrate my birthday in advance, we’re so blessed that we have three consecutive long weekends this year, Aug 21, Aug 28, and September 1. I told my husband about the Discovery Suites Hotel Promo and he approved it. He immediately called the hotel to check if there are still available room for August 20-21. The following day, off we went to Discovery Suites Hotel. The parking space is so steep, malaHanselma Highway sa kitid ng daan and paikot din. Hehehe! The hotel looks old na rin. We were there before 2PM and check-in time is 3PM. 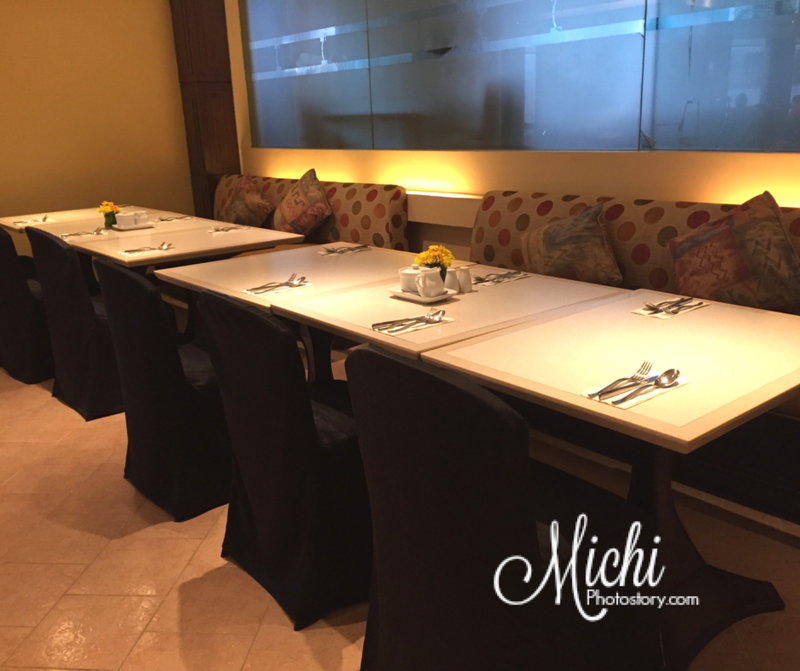 We stayed in Serendipity Lounge while waiting for our room. They also served our welcome drinks in the lounge. Several minutes had passed and we haven’t received any message, then one staff came to the lounge and he informed the other guests that their room is ready. Nagkatinginan lang kami ni hubby because we knew na nauna kami magcheck-in sa kanila. Then the staff saw my husband and he asked for his name para mafollow-up daw niya. 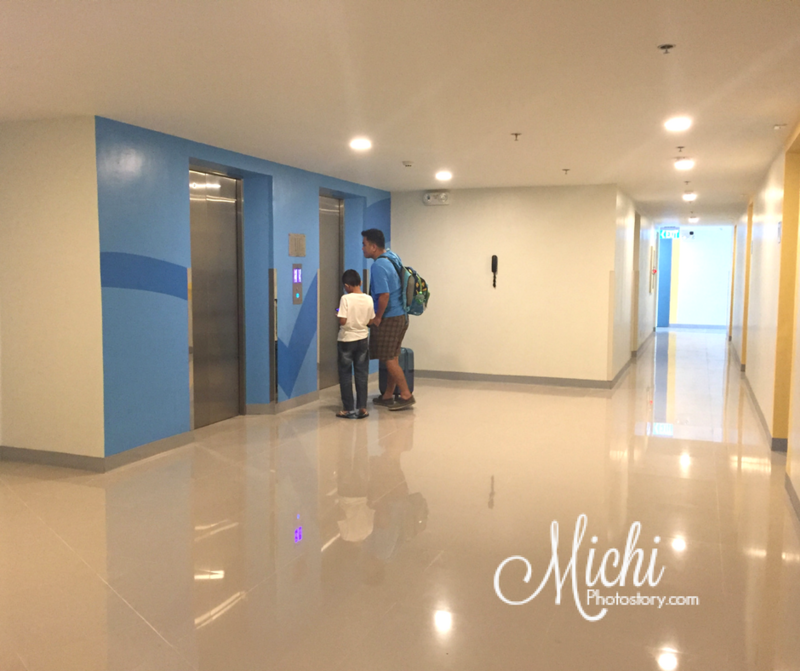 He is the same person who ushered us to the elevator. Time check, 3PM na and still no message so my husband called the reception to follow up. 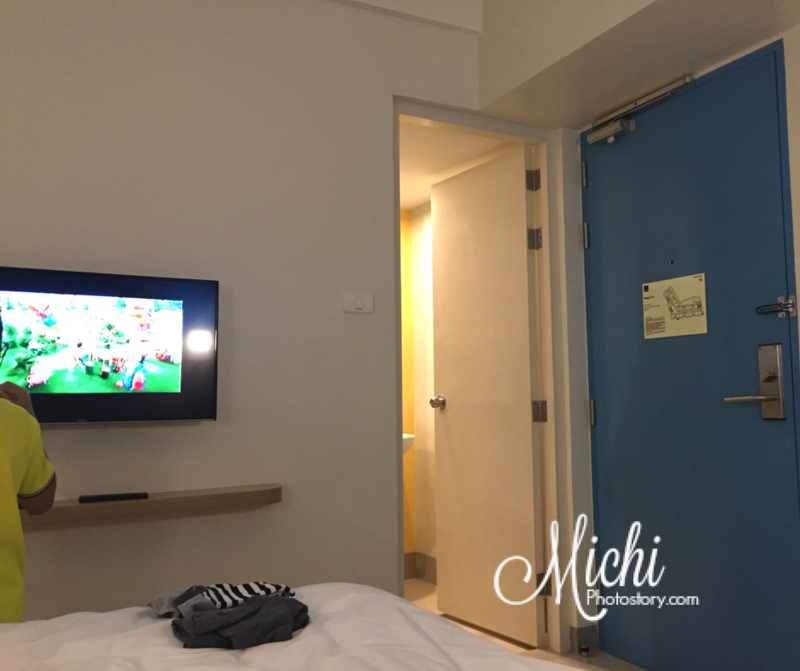 After several minutes, the staff gave our key card so off we went to our room. 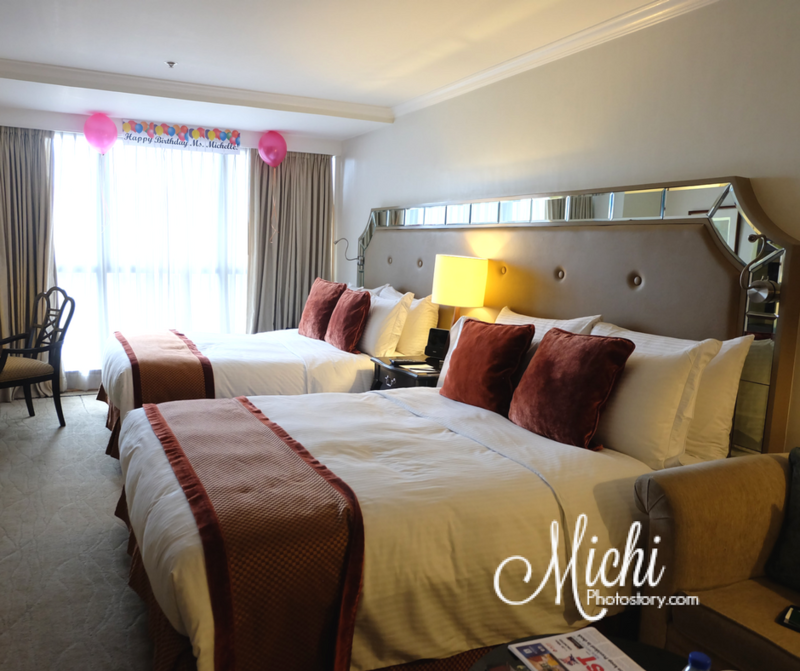 When entered the room, we were all surprised because we saw the “Happy Birthday Ms. Michelle” banner and two balloons. So I told my husband, kaya siguro natagalan kasi nagprint pa sila ng banner. Hehehe! 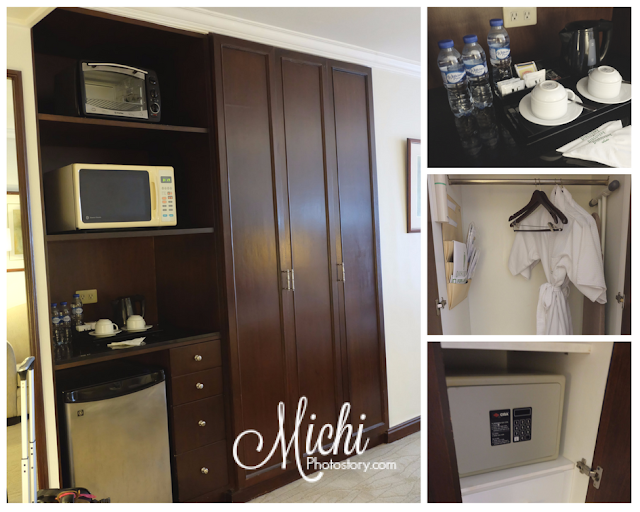 We stayed in Junior Suite room which is about 40 sqm to 45 sqm. The room is big enough for the three of us. We have a couch, two beds, and workspace area. I love the oven toaster and microwave oven because we can reheat our food if we want. There are complimentary bottled water and fruits. The bed has 4 pillows each, pillows have different softness, firmness and fluffiness. I’m very particular when it comes to pillows and beds so I’m happy that they have comfy pillows and bed. The bathroom has separate bath tub and shower area. It has no bidet. I want my son to experience the “Kids’ Musical Theater Workshop” sana but it was only available on August 19 and 26, 2017. Hindi pasok sa staycation namin but I’m glad that they have “Name Tape Painting” activity. At least my son has something to do. It was just a simple activity for the kids. 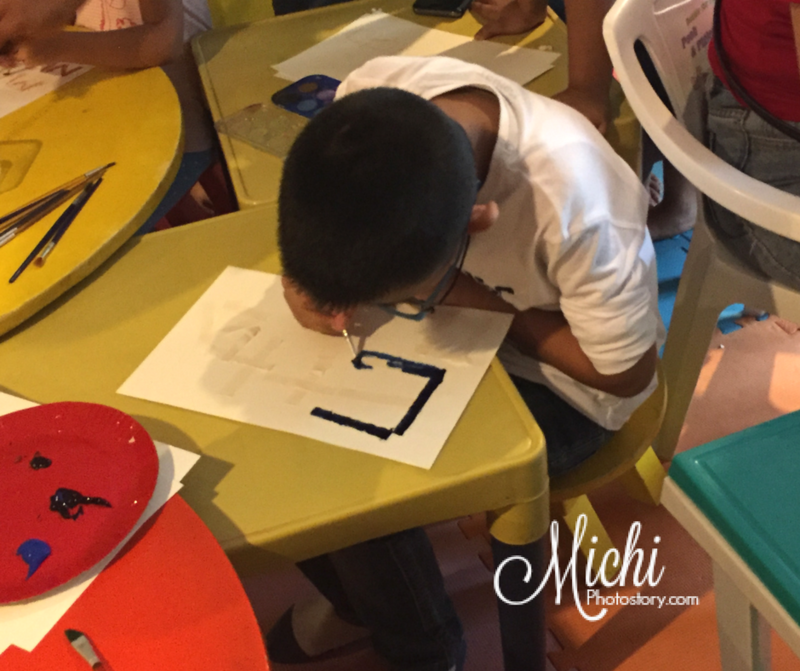 I hope they provide apron for the kids, baka malagyan kasi ng paint ang damit. After that, we went to the swimming pool. They have indoor pool and jacuzzi, the pool was 4 ft deep and cold. I forgot to bring his floaters, hindi ko expected na walang kiddie pool sa Discovery Suites. Anyway, he stayed in jacuzzi na lang kasi mainit. Hehehe! 12 years old below are not allowed to swim without companion kaya napabihis bigla si hubby. 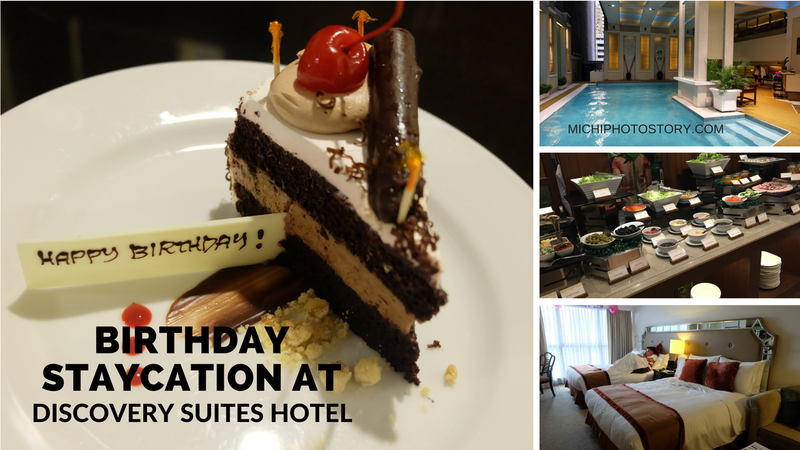 When we went back to our room, I was surprised when I saw the complimentary cake and card on the table. I thought banner lang ang surprise nila. 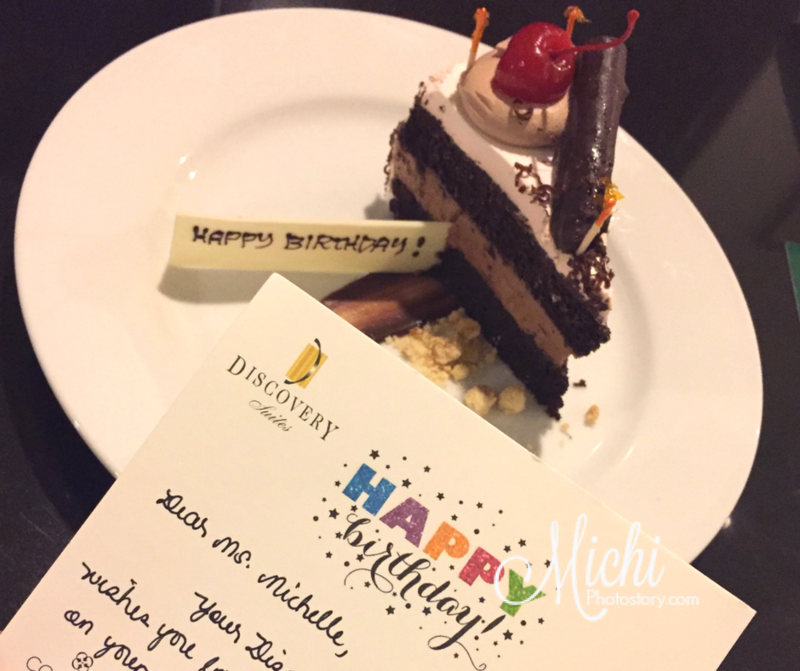 Thank you Discovery Suites! We just ordered, “Discovery Special Pizza” for our dinner. While eating, we heard again the noise beside our room. Nagkatinginan na naman kami ni hubby, Oh no! My hubby said, baka magdinner lang sila then okay na mamaya. We are an early sleeper, at 8PM ready to sleep na kami so we were hoping and praying na tatahimik din sila. But unfortunately, past 10PM na we can still hear the noise. We wanted to sleep but we can’t because of their noise. I know that they are celebrating birthday pero birthday staycation ko din ito and I want to rest na. My two boys were able to sleep despite the noise but I can’t. Past 12AM na sila tumahimik so dun pa lang ako nakatulog. I hope guests should consider the welfare of other guests too. Wala naman masama na magcelebrate at mag-enjoy but make sure na iminimize nila ang ingay nila. Pader lang pagitan namin. At that moment, I was asking myself if I made the right decision na magstaycation. I paid for it pero napuyat lang ako. Waah! Moving on, the following day we went to Restaurant 5 for our breakfast. 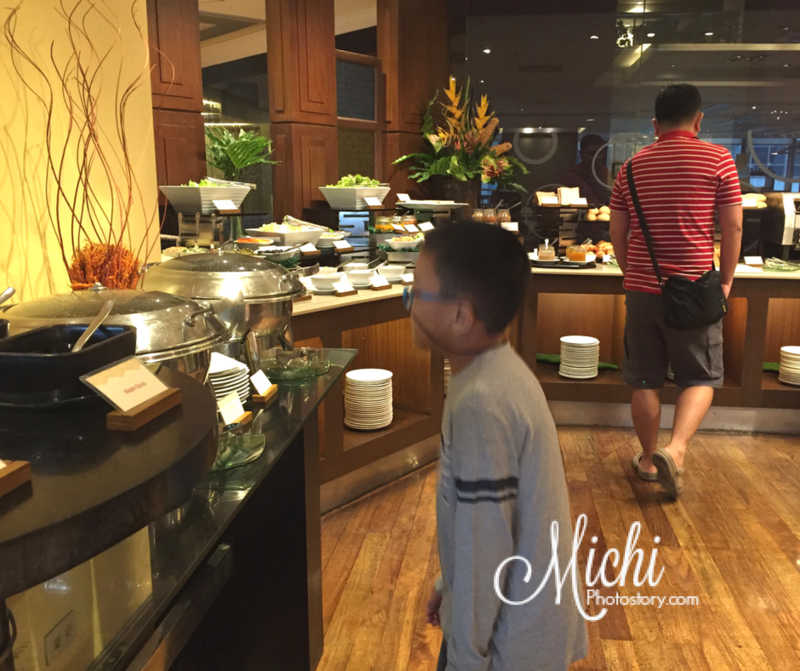 The room package has only two free breakfast, kid’s rate is 50% of P865. 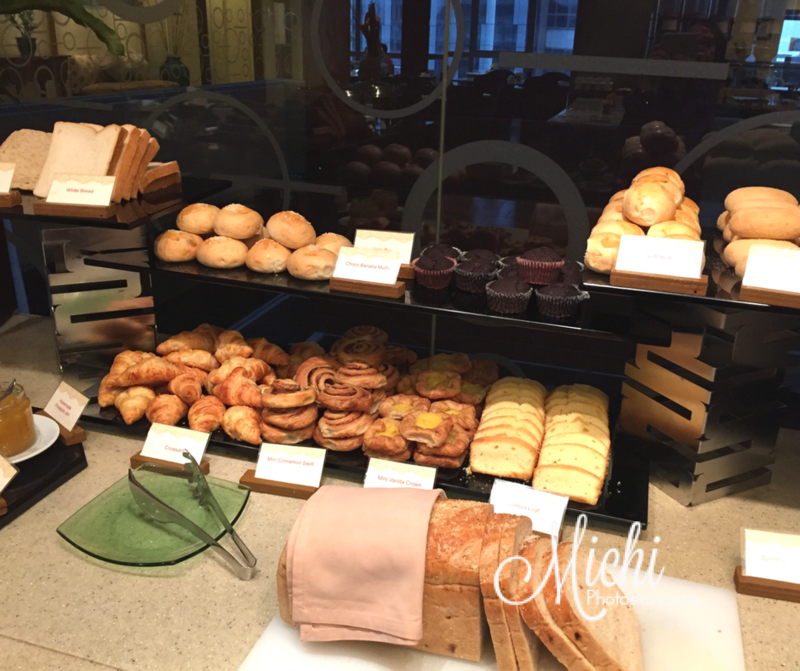 The restaurant is small, the buffet spread was not grand if I will compare it to other 4-5 stars hotel but we’re satisfied. Mabilis na kami mabusog e. hehehe! 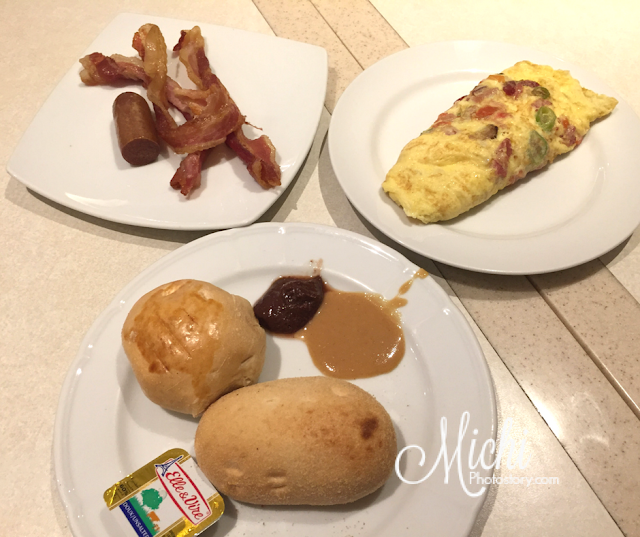 Most of the hotels that we’ve visited, they served crispy bacon but I liked soft bacon and Restaurant 5 offers two kinds of bacon. Yey! I also liked their beef arrozcaldo, my husband liked the Laksa and my son enjoyed their pancake with whipped cream. I really appreciate the birthday surprises of Discovery Suites Hotel. The service of the staffs is also good. 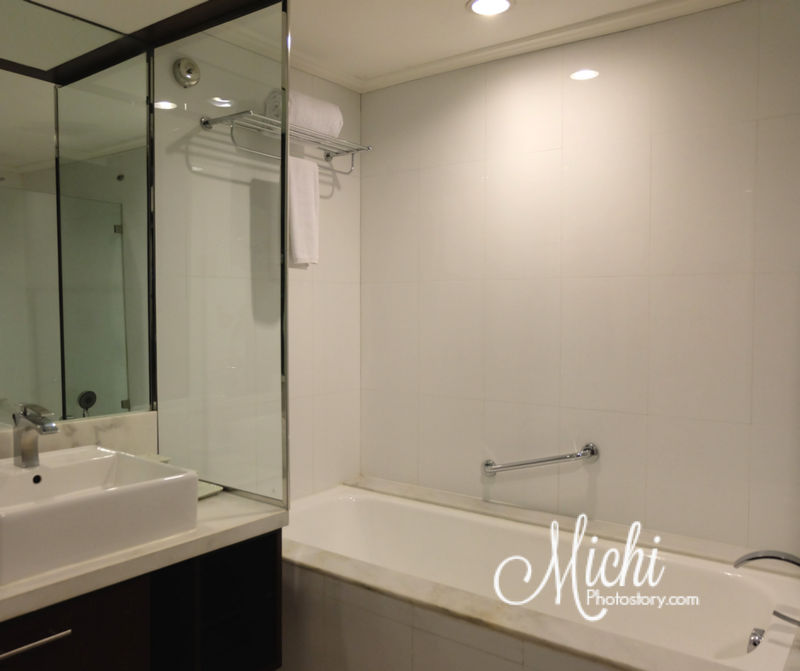 Our staycation would be pleasant kung hindi lang maingay ang guest na nakatabi namin. Well, that’s life you can’t choose your hotelmates. Hehehe! 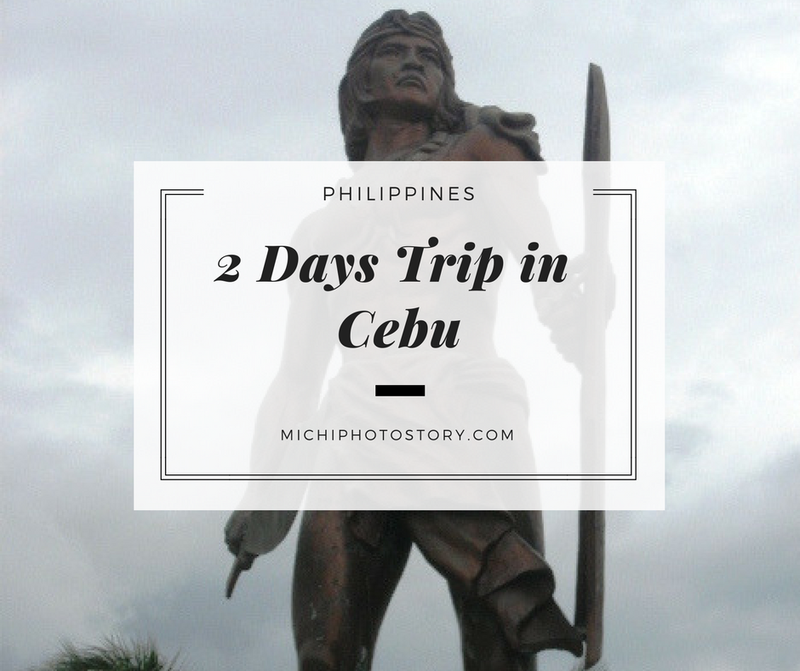 Hubby went to Cebu last week, I was tempted to book a flight so we can spend our long weekend in Cebu. But I need to practice self-control since I’m saving for our next home project. Anyway, I’m still happy because hubby bought our favorites from Cebu, which is lechon and danggit. Well, let me reminisce our 2 Days Trip in Cebu. 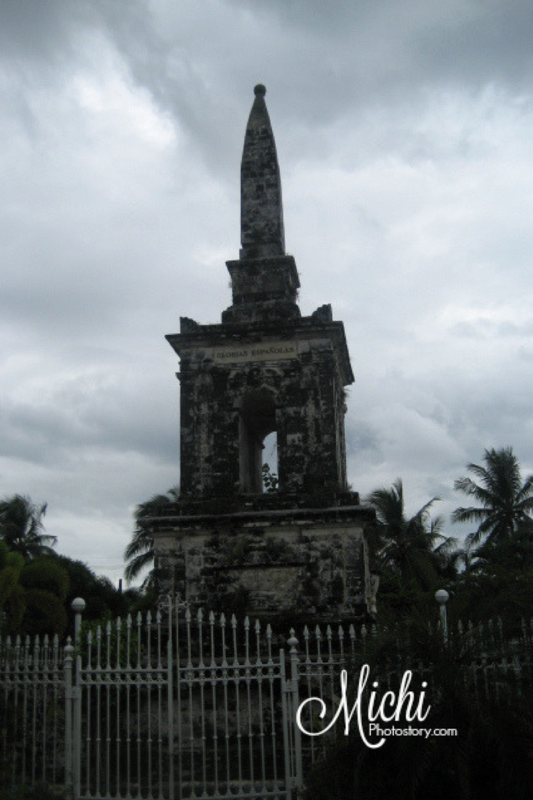 Six years ago, I celebrated my birthday in Cebu. It was my advance birthday celebration since my husband could only take a one day leave. We only have two whole days to enjoy our trip. We stayed in Fuente Oro Business Suites, it is a budget hotel that offers basic accommodation with breakfast. Since we arrived at 6AM, the room is not yet ready so we left our luggage and started our DIY Cebu City Tour. We took a jeep to Basilica De Sto Niño where we will start our walking tour. 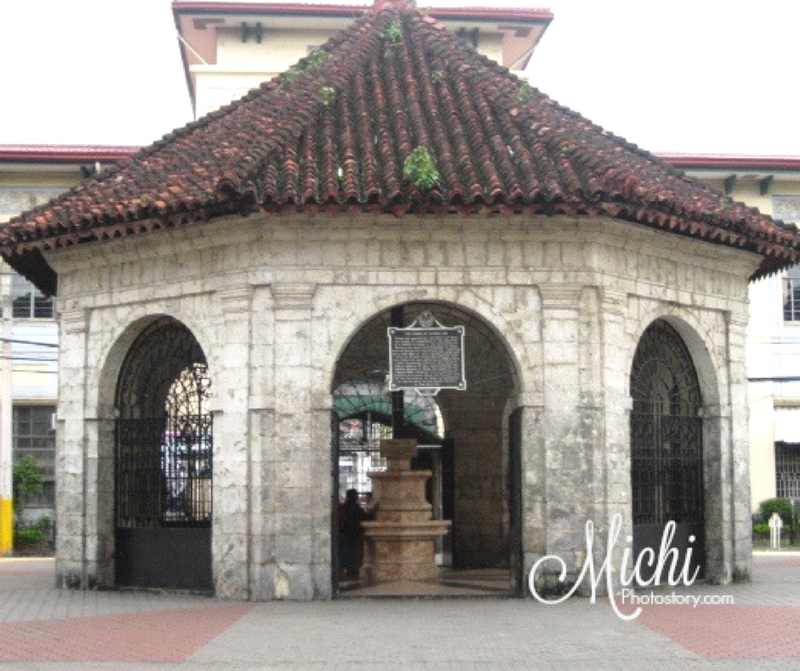 From the church, we just walked to Plaza Sugbo, Magellan’s Cross, City Hall, Malacañang sa Sugbo and Fort San Pedro. After exploring Fort San Pedro, we went straight to Taoist Temple. We rode jeep and habal-habal, from the gate we walked to the temple. It is better to take a taxi and let the driver wait for you. On our way back, we were lucky to get a taxi kasi ang hirap mag-abang. We thought that we’re going to walk back to Julie’s Shop. Ang layo talaga nun, naghabal-habal nga kami nung papunta. Next stop, we ate at Casa Verde so we can taste their famous ribs. Then we went back to the hotel and took a nap. 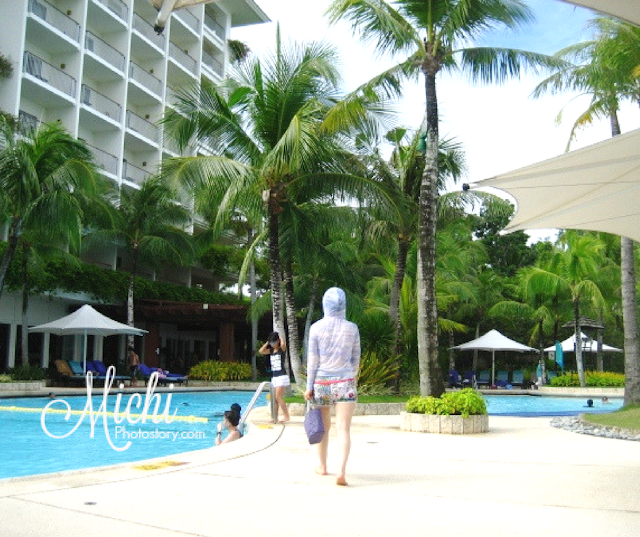 We did not continue our tour anymore because it was raining so we just had a quick trip at Crown Regency. We just watch 4D movie because I’m afraid of heights so I did not try the skywalk or sky ride. The following day, we woke up early so we can go to Taboan Market. Our trip in Cebu won’t be complete without buying pasalubong like danggit and dried mango. Then we ate breakfast and off we went to Mactan so we can see Lapu-Lapu Monument, Mactan Shrine and Magellan’s Marker. 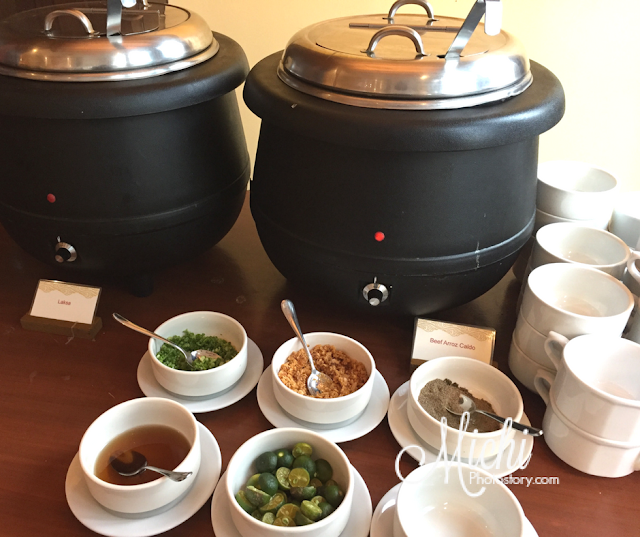 The famous Sutukil was also there but we did not eat there because we have complimentary buffet lunch at Shangri-la. 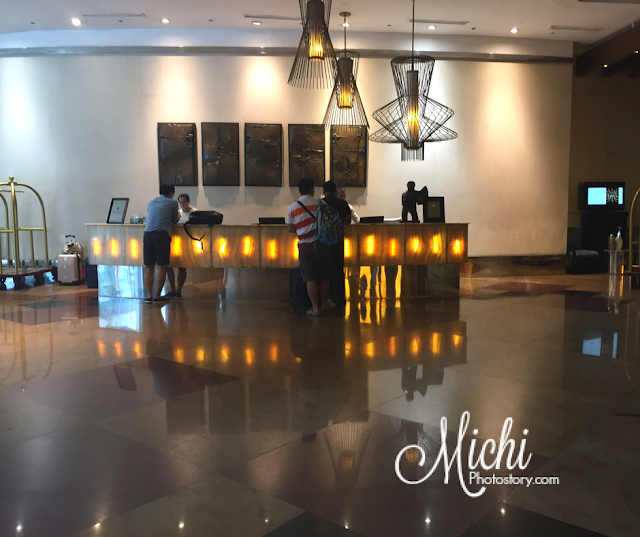 We had a day trip at Shangri-la Mactan Resort and Spa, the day trip package is from 8-9PM which is perfect for our evening flight. 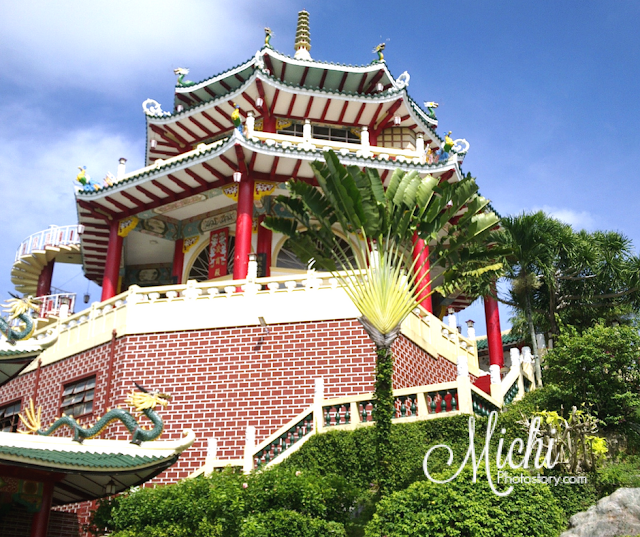 We really had a memorable experience in Shangri-la so last year, I inquired for their day trip and overnight package but day trip was not available at that time. 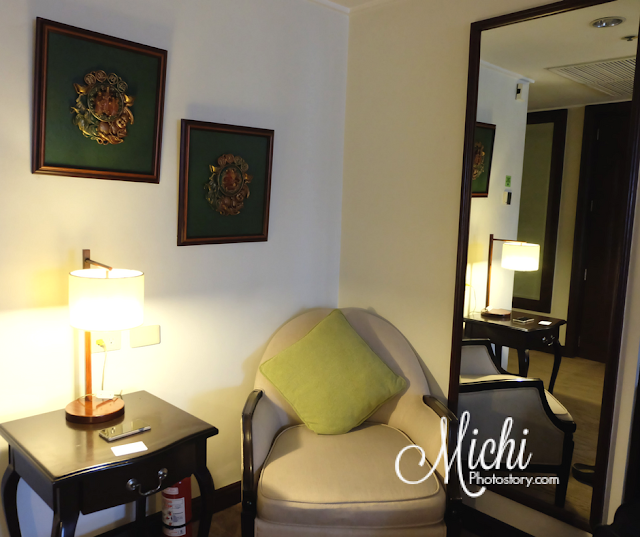 The overnight package was so steep for our budget so we just stayed at Crimson Resort and Spa Mactan. 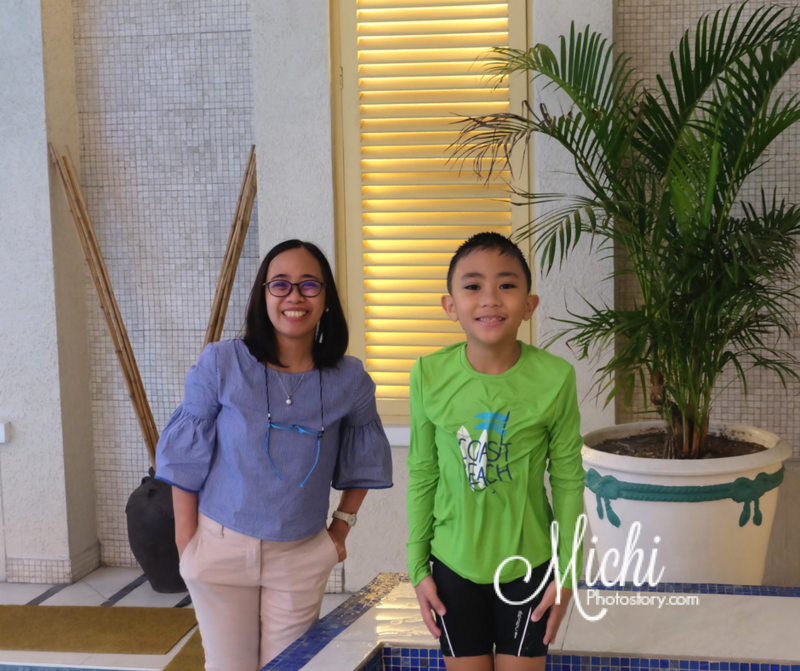 Hopefully, we can stay in Shangri-la Mactan Resort and Spa because I’m sure my son will enjoy their Kid’s Play Area which was not included in our Day Trip Package before. It was a short trip but we enjoyed it. On our way to Discovery Suites Hotel, we dropped by at a gas station in SLEX so we could have our lunch. I did not cook anymore since we will be sleeping in the hotel. 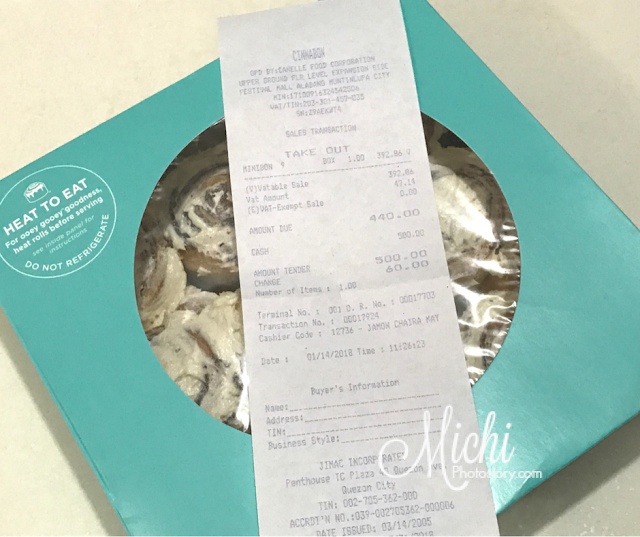 After our lunch, I saw the Cinnabon kiosk, I bought 4 pack Classic Minibon at P205 for our merienda. I want to try their Carvel ice cream but unfortunately, it was not available that day. Then when we reached the hotel, my son wanted to swim immediately, so he checked our bag, looking for his swimming clothes. He saw the cinnamon roll, I totally forgot about the bread, good thing my son saw it in our backpack. Discovery Suites Hotel has oven toaster and microwave oven so heating the cinnamon roll is not a problem. There is a heating instruction printed on the box. 1. Place uncovered on a microwave-safe plate. 2. Heat small roll for 15-20 seconds on high. Add 4 seconds for each additional roll. Me: No, I bought that before and you don’t like it. Ethan: Eh, sarap kaya. I like this mommy! Me: Mukha nga, ayaw mo na ko tirhan e. hehehe! So my husband heats the two remaining minibon because my son ate the first two pieces. 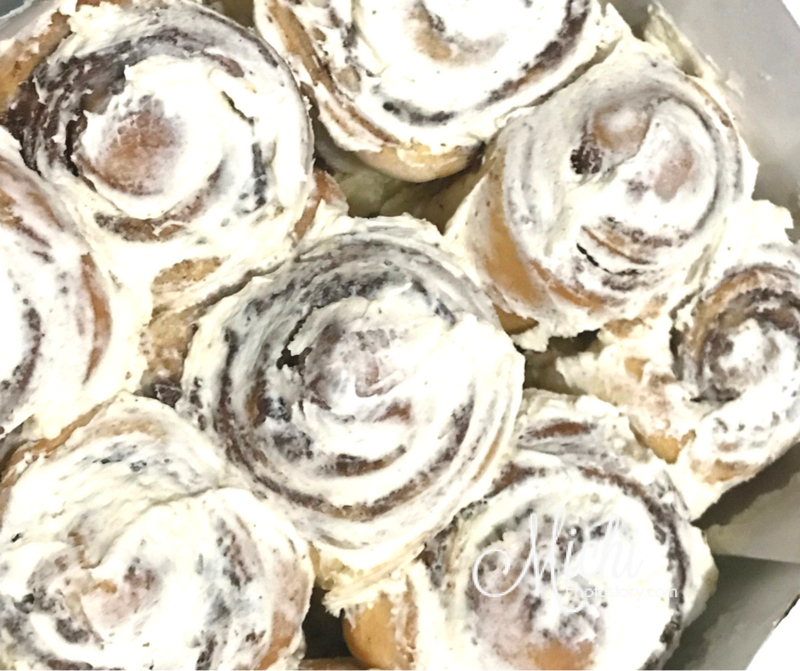 If only there is Cinnabon near us, I can add this to his baon list. Have you tried the other flavors? 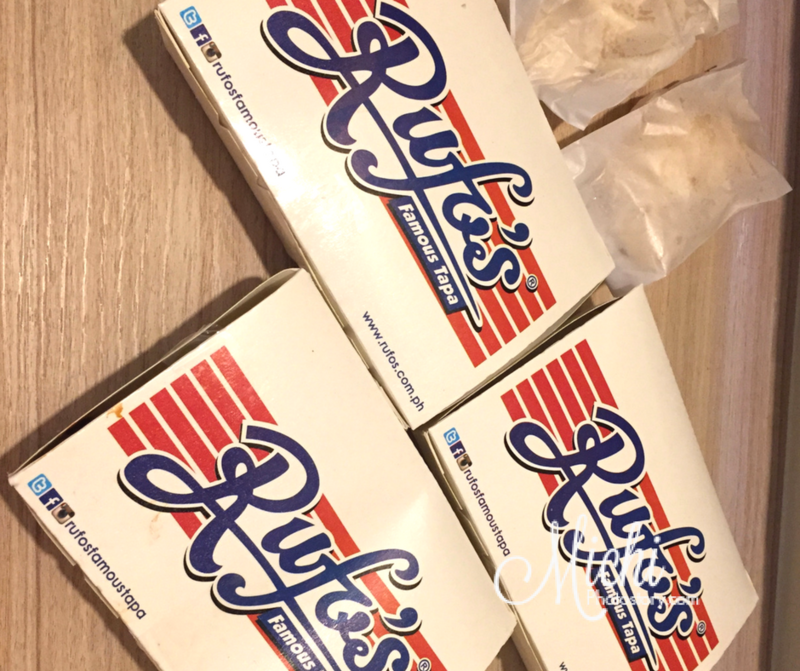 I only tried the classic one, hesitant to try other flavors because it is not cheap, baka masayang pag hindi namin type. Update: October 2017 - Open na ang Cinnabon Bakery sa Festival Mall. Yey, we can buy cinnamon roll every time we visit the mall. 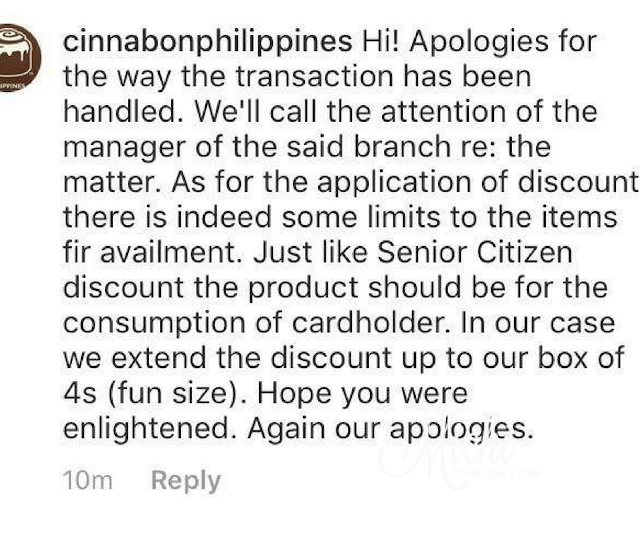 Update January 14, 2018 - Cinnabon Festival Branch Did not Honor my PWD ID. I posted this on my Instagram account but I will just share this so others will be informed too. 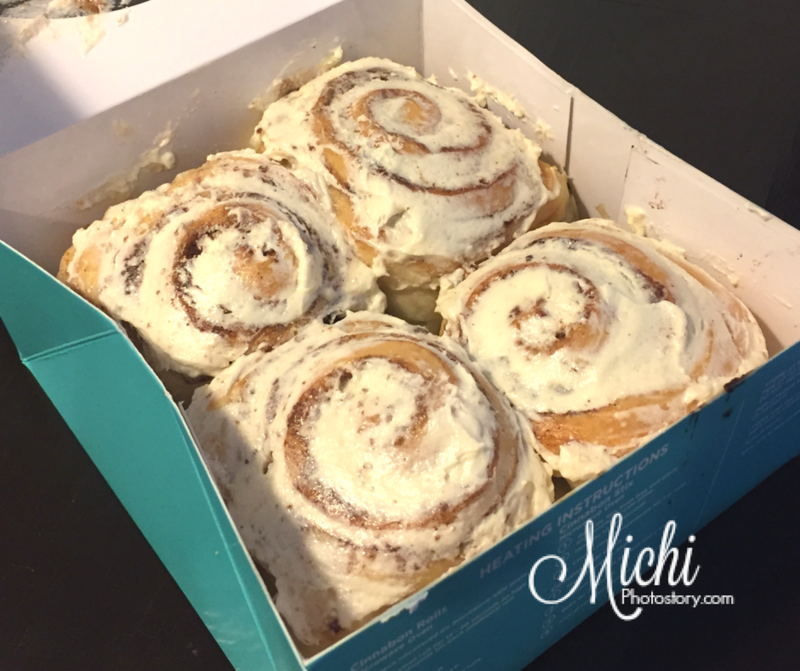 After my son’s check-up, I went to Cinnabon to buy minibon. I showed my PWD ID and the cashier gave it back to me without writing anything and without saying a word. So I ordered 9pcs of Minibon. Then she prepared everything and after that, she said I need to pay P440. I told her that I have PWD ID. Then they told me (2 staff na sila sa counter) na malaki na daw discount ng Minibon 9pcs kaya WALA Discount. Sa Minibon 4pcs meron. I paused for a while and I said “ganun?”. 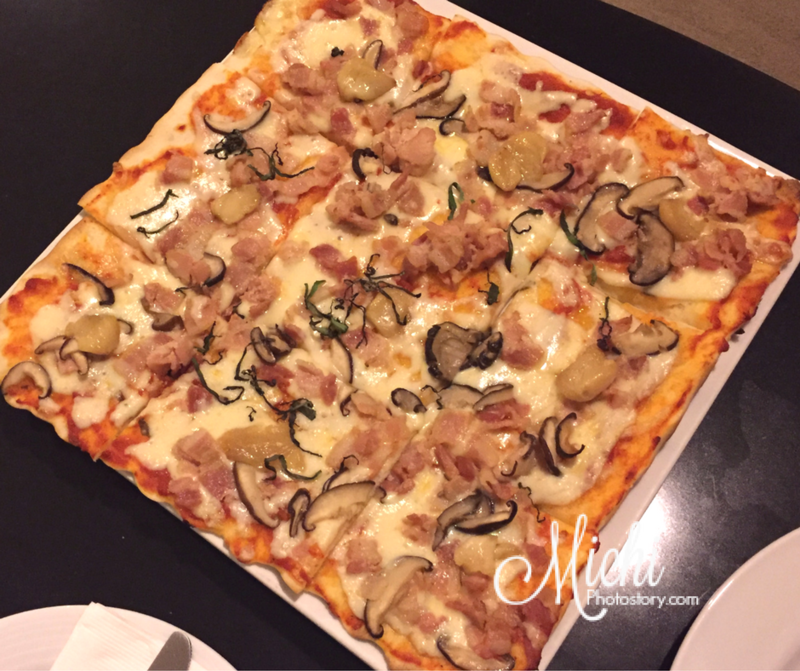 I paid P440 but I was really disappointed. 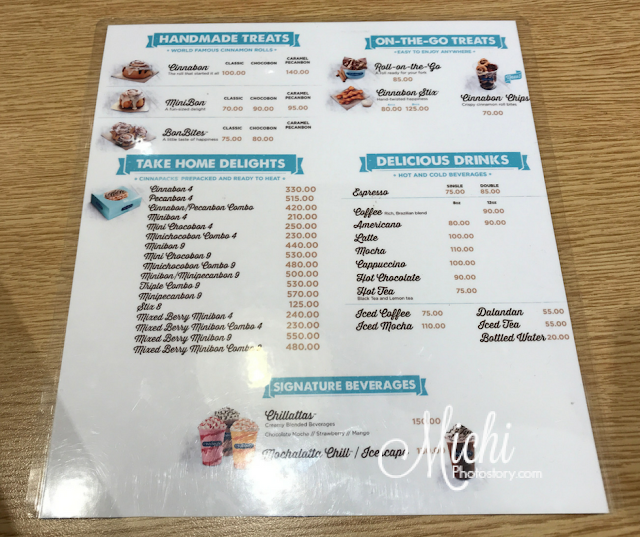 The cashier knew that I have PWD ID, she should inform me that I could only get a discount if I order Minibon 4pcs. If she said that, I will only order 4pcs as long as I could use my benefits. I did not change my order kasi naiinis na rin ko. This was the first time that my PWD ID was rejected. As far as I know, the discounts are not charged to the establishment. They can claim these in the form of tax discounts from the government so I don't understand na parang mahirap para sa kanya na ibigay yung PWD discount. Well, for your information. Seniors Citizen and PWD have 12% vat exemption and 20% discount privilege exclusively for the personal consumption. I just learned that for promotional offers, the Senior Citizen/PWD may avail of the promo or the 20% discount, whichever is more favorable to the Senior Citizen/PWD. Based on my experience, the staff did not inform me about my PWD discount or she doesn't care about my rights and benefits. She said, malaki na daw discount sa Minibon 9pcs, so let me compute. 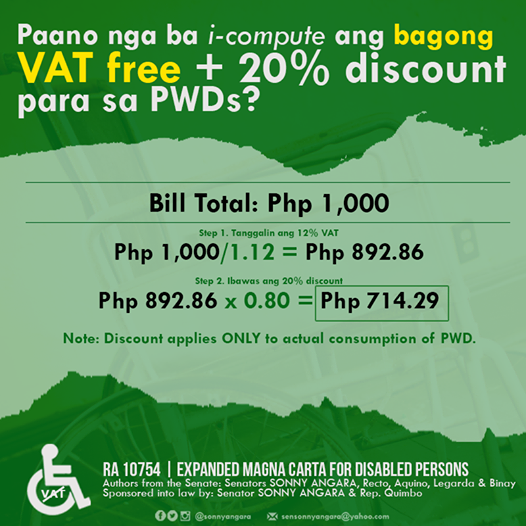 This is the infographic from Sen. Sonny Angara "How to Compute for Senior Citizen or PWD Discount". The total is P430 for 9 pcs compared to Minibon P440 without the discount. But of course, if she informed me immediately that I can only get discount on Minibon 4s for P210. I will change my order, I will just order 2 Minibon 4s. 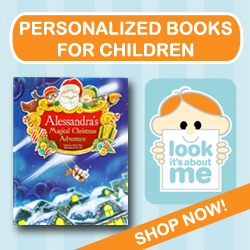 The total is P360 for 8pcs. Since I posted this on my Instagram and tag #cinnabonphilippines. I received a reply within the day. 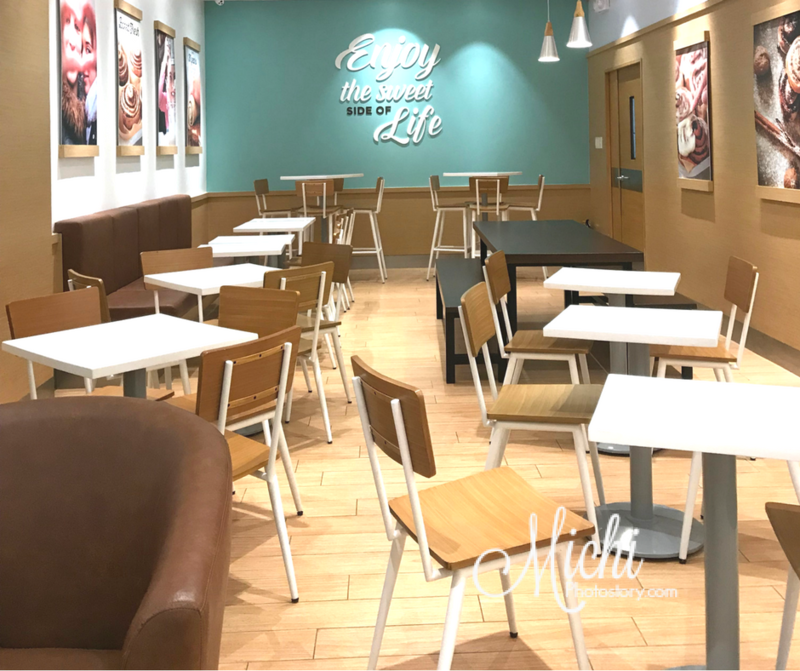 And because of my not so good experience at Cinnabon Bakery - Festival Mall, it took me a long time to pay a visit to Cinnabon Bakery. But this time I went to a different branch which is Cinnabon SLEX Gas Station. I gave my PWD ID and ordered 2 4-pack Minibon and the cashier processed my order. I paid P360, same computation ko above, 1 4-pack Minibon for P150 and 1 4-pack Minibon for P210. 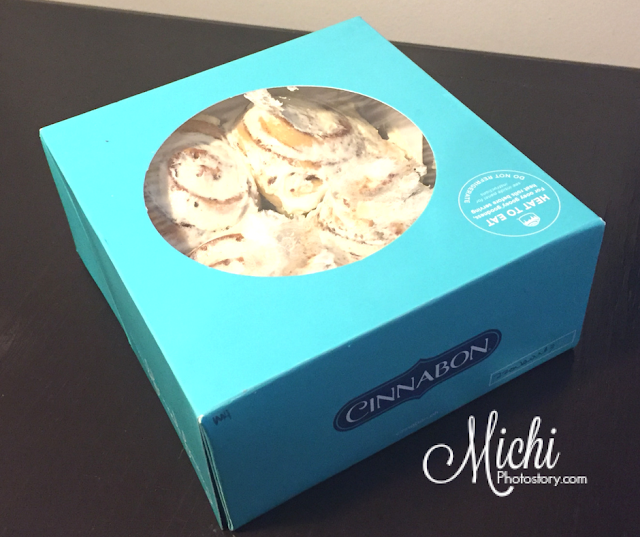 When my son saw the cinnamon roll in the fridge, he asked me if I got a discount already. Oh di ba, di rin makalimutan ng anak ko yung hugot ko sa pagdeadma ng PWD ID ko dati. hehehe!